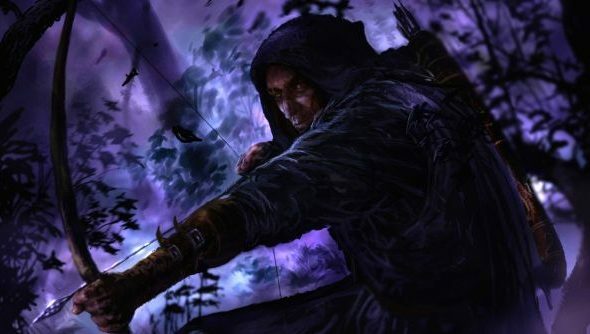 It’s about time we heard about Thief 4, Eidos Montreal’s follow-up to the the classic stealthy series. As fitting for a game about subterfuge, what we’ve got is unofficial leak: a cinematic taken from an artist’s trailer. It’s low-res, a bit grimy, but it has Garrett, bows, and loot glint. According to artist Eric Wong’s Linkedin, he worked as an artist for a creative agency that worked on both Deus Ex and Thief. He worked there between October 2010 – January 2011. And the work he produced on Thief 4 looks like this. If this is the target video, it shows Garrett with a new folding-out bow technology and a slick and an almost ninja-ish appearance. There’s definite Thief-style lock-picking in there, with the two picks. And it is Garrett: the character has a scar on his face where our favourite Thief’s eye was plucked out. I didn’t recognise he dropped bomb, but expect if it’s a counter-measure’s it’s his flashbang.